I have a Wing Chun class myself. The results in making my pupils aware of their feet and pelvis (movements) is just amazing, their stance improved right away, pressure can be sunk into the heels way better. Russian born, Moshe expatriated to Palestine as a 14-year-old boy. He was a freedom fighter and sportsman. While a secondary school student, he was involved in civil engineering and construction. His university days were spent at the Sorbonne in Paris, culminating in a Doctor of Science in electrical engineering with studies in physics. While in Paris he met Jigoro Kano, the founder of Judo. Moshe became one of Europe’s first Judo blackbelts, and co-founder of the Judo Society of France. In 1935, when Frederic Joliet and his wife Irene Joliot-Curie won the nobel prize for chemistry, Feldenkrais was their lab assistant. 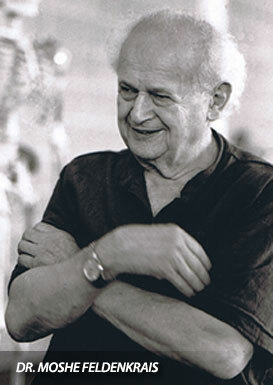 Feldenkrais was a true renaissance man in his thinking. Moshe suffered injuries from sports and Judo. At that time, no competent surgical intervention was available. So Moshe found the means within himself to recover and improve his ability to move and function. This was one of Moshe’s great achievements. The work Moshe did with himself demonstrated the capacity we have for self initiated learning. His own remarkable recovery became the basis for his working in his innovative way with others who suffered from obstacles to their performance and functioning. His work began while he was in England as a visiting scientist during World War II. His method continued to mature in Israel. From the early 1950’s on, and he developed the processes that came to be known as Awareness Through Movement® and Functional Integration®. In 1968, he trained his first group of 15 practitioners in Tel Aviv. He was invited to visit the United States in 1971. In 1975, he began a training group of 65 people in San Francisco. His final training began in 1980 in Amherst, Massachusetts with 220 students in attendance. Moshe died in July of 1984 as an indirect result of injuries he suffered in a 1981 automobile accident in Zurich. His legacy is carried on by the students he inspired and trained.